by Rebecca M. De Riggs on Go Ahead, You're Home! I enjoyed this book totally. It was easy to get immersed in the story and difficult to put the book down before I finished reading it. Is there another book in the making? by Vivian Le Blanc on Go Ahead, You're Home! After quite some time there is this book, that I could read like they say in a 'jiffy'. And guess what? I am going to read it over and over again. Because there are those 'golden nuggets; hidden in there that keep popping up. And I think this is a book that keeps on living, because the older and more mature you become, the more you will understand....even what has not been written. Tirzah my friend, keep on pondering an keep on writing. I know you are strong and I know you will see your dreams come true. Be Bold, Be Strong, 'cause the Lord your God is with you! by Roy D on Go Ahead, You're Home! A book review is a critical assessment of a book. It describes and evaluates the quality and significance of a book. Even though I read it at least 3 times, mostly browsing and searching, I could not detect the main purpose other than highlighting the author's writing skills. However, for those religious perfect people as I experienced them that also know the author as a worship leader in the past “Go Ahead, You’re Home” some passages is a treat for lovers of “historical fiction” in particular when it pertains to the revealed life altering intimate choices made. With regards to the author's marriage and divorce, I'm convinced that the union was bound to fail because the dude was a fast-talking, smooth talking con-man who, for years, was able to camouflage his dishonesty and addiction to hard drugs that were frying his brain.You were unequally yoked as so many of us. Nevertheless, he was also a brilliant entrepreneur with some out of the box bright ideas when sober. Had he been sober all the time you would have definitely noticed that he had “found” the best type of virtuous and supportive wife any ambitious man desires to have as his lady. If that was the purpose of writing the book then it didn't miss its target. The book ended leaving me with an empty feeling as if something is missing as if something important was purposely omitted. by Rinze Koolstra on Go Ahead, You're Home! 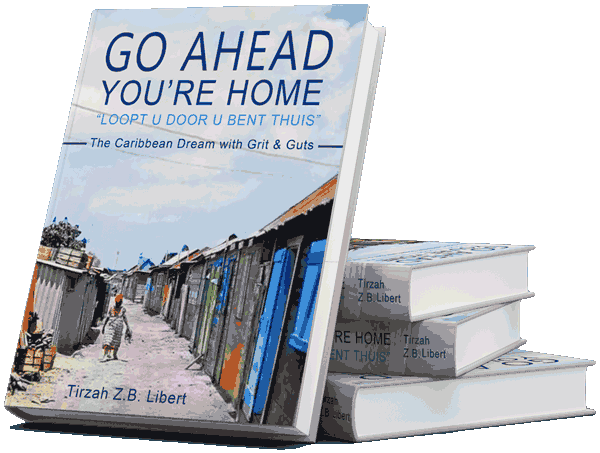 Autobiography written by warm, honest and brave woman who is raised by Christian parents of large family on Curacao. Beautifull and unique story that provides insight in strong family relations existent in the Caribbean, particularly in the Dutch Antilles, and in her struggle for life depicting both successes and personal failures. Author has laid witness of what God has done in her life including hard personal circumstances, never losing hope. Easy book to read that should not be missed. by Mirjam on Go Ahead, You're Home! Tirzah, genoten van jou, je boek, je transparantie en eerlijkheid. Heel veel herkenning als kind van een moeder die ook haar hoofd boven water moest zien te houden met vier kinderen Mooi dat jouw kinderen een bijdrage wilden leveren aan je boek. Mooi om meegenomen te worden in jouw story waar je zo makkelijk leesbaar doorheen rolt. Ik zie uit naar je tweede boek en weet dat wij op een dag écht thuiskomen. by Joseph 'Jopi' Hart on Go Ahead, You're Home! Having known Tirzah for some time, I never had any idea about her past, until I read her autobiography 'Go Ahead, You're Home'. She does not embellish the past and is not afraid to paint herself in that past as she really was. That takes courage and is proof of her dedication to give the reader the bare truth and nothing but the truth. AWESOME. by Mirallis on Go Ahead, You're Home! Krachtig, knap en met genoeg gevoel om alles in balans te houden, geweldig!!! by Asta Diepen on Go Ahead, You're Home! Beautiful story. I recognize a lot. I grew up in a broken family also. My mother had to take care of my older sister and me when I was only 15 months old. It wasn't easy for my mother. Being a woman alone, people don't always take you seriously. She did a great job back then, and so did you Tirzah! Inspiring to read your life story and so nice to know you and your children are doing great. by Yvonne Damberg on Go Ahead, You're Home! A beautiful story, every woman should read this book. The courage you had, to choose for yourself and your children, and enter into the depth of life, where you didn't know what life is going to be? Your struggles became your victory and outreach, your tears made you the master of your destiny, and look at what you have accomplished. Your son and daughter became the stronghold of your life and you made the best out of it, by holding your head high and focus on the future for you and your kids. The story-teller was healed and rise to a place in her mind where there are no limits. Keep on doing what you are doing, and secondly take the step to make a film for the women and young men who are struggling with life's decisions and can't see the outcome that they have to make. You opened a gateway, keep on marching. The sky is Not The Limit! by Zuri Todd on Go Ahead, You're Home! A beautifully written story, filled with humour. But also one that shows determination and perseverance. Each page keeps you wondering what will happen next, making it impossibe to put the book down. While reading, it took me back to the Caribbean, my roots. Bravo! I hope to read more books written by you Tirzah.